If you've an interest in the Toyota Prius, our team at Mojave Auto Group would love to visit with you. 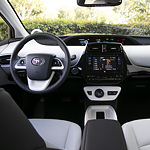 This includes discussing the outstanding safety features that set the Toyota Prius apart from other cars in its class. The Toyota Prius safety features include lane departure alert that comes complete with steering assist. The system activates when a deviation occurs and you are traveling at 32 miles per hour. The system broadcasts both a visual and audio alert to ensure you properly are warned. The new Prius safety features also include automatic high beams. Thanks to the automatic high beams on the vehicle you can rest easier knowing that you will have proper illumination when needed even if you are focused on tending to driving in nighttime or storm conditions. This ensures a proper detection of other vehicles, other obstacles, and pedestrians.